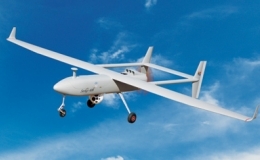 Denel Dynamics is continuing with flight testing of its Seeker 400 and Hungwe military and civil unmanned aerial vehicles (UAVs) ahead of serial production. The Seeker 400 first flew at the Alkantpan test range in the Northern Cape in February. The smaller civilian Hungwe also flew at the same time. The flights come ahead of production starting later this year - Denel Dynamics is executing a production contract for the Seeker 400s launch customer. It has an endurance of 16 hours, a ceiling of 18 000 feet and a cruising speed is 150 km/h. Denel Dynamics says it is inaudible at altitudes higher than 3 000 feet above the ground and invisible to someone on the ground when flying at typical operating altitudes of between 4 500 and 9 000 feet. The Seeker 400 can carry 100 kg and this can include two payloads at the same time, including electro-optical/infrared and radar as well as a laser rangefinder and illuminator for target designation. Denel says an electronic surveillance payload is available for the detection and location of radar emitters. Future upgrades will include satellite communications, and sense-and-avoid capability in order to obtain civil aviation certification. Currently, the Seeker 400 has a range of 250 km, but it could be upgraded to use satellite communications, which would allow it to operate at much greater ranges. With the use of the existing tactical ground station (TGS), the range may be extended to 750 km. Although the Seeker 400 was developed with armed surveillance in mind, it is not armed at present. However, Denel Dynamics said it will definitely be in the future, with either Impi or Mokopa missiles under the wings. Meanwhile, Denel Dynamics has improved the Seeker II (now known as the Seeker 200) and offers it with new Goshawk II sensors with electro-optical/infrared imagers and a laser range finder, and an improved engine that extends endurance from eight to ten hours. The companys civil Hungwe has a 100 km range from its ground control station (GCS), a day/night camera and an endurance of three hours over target at 100 km range. It can be deployed within 30 minutes and transported aboard a 1 ton commercial vehicle. Denel Dynamics is working on a catapult-launched variant. Only two crewmembers are needed to operate the aircraft, if they are sufficiently skilled. Denel Dynamics said the system is in the final development phase with flight being concluded. The company is in contact with the Civil Aviation Authority (CAA) to use the aircraft in civilian airspace at present the South African CAA has made it illegal to operate a UAV in civil airspace pending the establishment of new regulations. Denel Dynamics is also investigating rotary winged UAVs and has started with the concept design of a vertical takeoff and landing (VTOL) UAV and is engaging with relevant stakeholders. It is also looking at developing a new target drone to replace the Skua.